Jean de Reszke (14 January 1850 – 3 April 1925), was a Polish tenor who was a major male opera star of the late 19th century. Jan Mieczysław Reszke was born into comfortable circumstances in Warsaw, Poland in 1850. Both his parents were Poles; his father was a state official and his mother a capable amateur singer, their house being a recognized musical centre. He sang as a boy in Warsaw's cathedral and later studied law at the city's university, but after a few years he abandoned his legal schooling to study at the Warsaw Conservatory with the Italian tenor Francesco Ciaffei, who trained him as a baritone. At age 19, Jean and his father visited Italy. In Venice he attended a performance in which the Italian baritone Antonio Cotogni sang. Cotogni's singing made such a profound impression on him that the young de Reszke followed him for the next five years wherever he performed—London, St. Petersburg, etc. During that time he was under Cotogni's tutelage, also as baritone. In January 1874, he made his debut in Venice as Jan de Reschi (he later changed it to Jean de Reszke), undertaking the baritone part of Alfonso in a production of Donizetti's La favorite . The following April, he sang for the first time in London, performing at the Theatre Royal, Drury Lane, and a little later in Paris, essaying an array of different baritone roles. De Reszke displayed limitations as a baritone and he withdrew from the stage to allow for a further period of study, this time with Giovanni Sbriglia in Paris. Under Sbirgilia's tutelage, his voice gained remarkably in the freedom of its upper register. Accordingly, when he made his first operatic reappearance in 1879 (in Madrid), it was as a tenor, scoring a success in the title-role of Meyerbeer's Robert le diable. Indeed, the then 29-year-old de Reszke's immense fame as a singer dates from this moment. He sang regularly at the Paris Opéra during the ensuing years of his vocal prime and, in 1887, was re-engaged by the management at London's Drury Lane, delivering among other things a notable Radamès in Verdi's Aida. The following year he was heard again in London, appearing no longer at Drury Lane but at the Royal Opera House, Covent Garden, lending his unique blend of dash and charm to the following roles: Vasco da Gama in L'Africaine and Raoul in Les Huguenots (both by Meyerbeer), Faust in Faust (by Gounod), Lohengrin in Lohengrin (by Wagner), Riccardo in Un ballo in maschera (by Verdi), and Radamès again. De Reszke's 1888 Covent Garden appearances proved exceedingly popular with audiences. Indeed, they were mainly responsible for the revival of the operatic art form as a fashionable amusement in London. He would sing in the British capital nearly every year until 1900, adding a number of new roles to his canon during this time. They included, among others, John of Leyden in Meyerbeer's Le prophète, Don José in Bizet's Carmen, Roméo in Gounod's Roméo et Juliette, and Wagner's Tristan in Tristan und Isolde, Walther von Stolzing in Die Meistersinger von Nürnberg and Siegfried in Siegfried. He also gave (in 1894) a single performance as the tenor lead in Massenet's Werther. De Reszke's singing was admired by Queen Victoria, and between 1889 and 1900 he was invited to take part in a number of royal galas mounted at Covent Garden or command performances held privately at Windsor Castle. 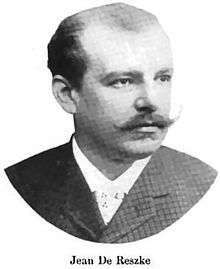 In 1891, de Reszke sang in the United States for the first time. From 1893 to 1899 he starred in every season at the Metropolitan Opera House in New York City, virtually duplicating his London list of operatic roles and having an equally charismatic effect on trans-Atlantic audiences. One of De Reszke's colleagues, the Australian lyric soprano Nellie Melba, became a close personal friend of his during this period. She replaced the ageing star Adelina Patti as the most celebrated of his various stage partners, and she speaks admiringly of him in her memoirs. Jean de Reszke in the title role of Wagner's Siegfried (photo by Nadar). He was closely associated with the French and Wagnerian operatic repertoires during the peak of his career at Covent Garden and the Met. His French signature parts were considered to be Meyerbeer's three big tenor heroes (Vasco, Jean and Raoul), Gounod's Faust and Romeo, and the title role in Massenet's Le Cid (which was written expressly for him). De Reszke was equally successful singing in German, and his appearances as Lohengrin, Walther von Stolzing, Siegfried and Tristan were lauded by music critics, who praised him for demonstrating how the extremely demanding and often declamatory music that Wagner wrote for his heldentenors could be sung with beauty of tone and, wherever practicable, a smooth legato line. American-born Lillian Nordica was the most illustrious of the dramatic sopranos that partnered him in Wagner's operas. During his heyday, De Reszke sang Italian operas less frequently than French or Wagnerian ones. 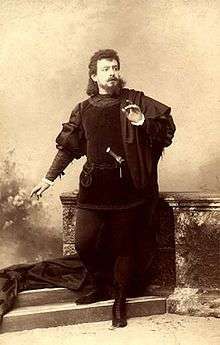 Indeed, in 1891, his keenly awaited interpretation of the title role in Verdi's last tragic masterpiece, Otello, had disappointed the critics somewhat; while expertly sung, it lacked the clarion ring and elemental force that his main tenor rival, Francesco Tamagno (1850–1905), had brought to the part. On this occasion Shaw also chided him for his laziness and his customary lateness in meeting cues, though by and large he was highly appreciative of both Jean and Edouard de Reszke's abilities. He subsequently busied himself breeding racehorses in Poland and teaching singing in Paris and at Nice on the French Riviera. His pupils came from a variety of countries and included Bidu Sayão, Bessie Abott, Louise Edvina, Claire Croiza, Arthur Endrèze, Vladimir Rosing, Mafalda Salvatini, Clive Carey, Maggie Teyte and Miriam Licette. The already well established Austrian tenor Leo Slezak also took lessons from de Reszke in 1908–1909, seeking advice on how to further improve his vocal technique. See: List of music students by teacher: A to B#Jean de_Reszke. De Reszke died at his villa in Nice in 1925, having contracted influenza. He was aged 75. Noted for his rounded timbre and matchless ability to combine a virile singing style with an exceptional degree of gracefulness and vocal refinement, de Reszke is generally regarded as being one of the very greatest tenors of all time. It is therefore highly unfortunate that the release of his only two commercial gramophone records, made in Paris in 1905 for the Fonotipia label, never took place. The matrices and test pressings appear to have been destroyed at de Reszke's insistence after he expressed his disappointment with the results. (Rumours of the survival of one of these records in the 1950s turned out to be false). Only a few Mapleson Cylinders, primitive recordings made privately during actual performances at the Metropolitan Opera in 1901, exist to give us a faint souvenir of him at work. They have been released on CD by the Symposium label, together with transfers of similar cylinders bearing snatches of the voices of other Met artists of the era. Jean de Reszke's younger brother Édouard de Reszke was also internationally famous as an operatic singer—but in the basso range. Édouard's operatic debut was in Aida in Paris in April 1876, under Verdi's baton. His debut was a success and he proceeded to sing with distinction alongside his brother for many years on the London–Paris–New York circuit. Édouard was said to have had an even more impressive voice than the one possessed by his older brother; but music critics considered Jean to have been the more cultured, conscientious and sophisticated artist of the two. List of appearances after the Royal Opera House database. Wikimedia Commons has media related to Jean de Reszke.